Well, it seems that we’ve found the problem. While our heart is still beating with mad passionate love, it isn’t actually beating, anymore. But, while that would be a problem for some, we can probably figure this all out yet. After all that planning for our potential nuptials, it seems that the apocalypse might have struck and what we need to do now is wonder what a monstrous, reanimated construction supposed to do when you’re ready to dance and enjoy the beginning of marital bliss… but look just a little different than you might have initially expected to appear? Fret no more, my ghoulish friend, because we have exactly what you need in this Zombie Groom costume. 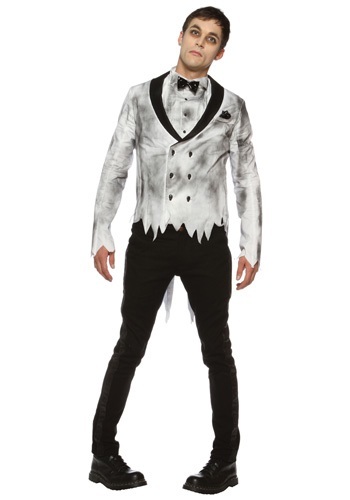 We’ve got a luxurious wight tux jacket that has admittedly gotten a little smoky gray with age… and a little tattered after crawling up from the graves… and the tails are pretty jagged. But, it still looks smashing and matches well with the dickie that shows the same smoky look. Now it is all coming together well! The black bow tie is still in flawless condition. All we need now is to find your adorable corpse bride and walk down the aisle. Good thing that we know what we’ll be having for food at the reception!The guests!